THE ONWARD MOVEMENT OF MAN–THE ENERGY OF THE MOVEMENT – THE THREE WAYS OF INCREASING HUMAN ENERGY. Modern science says: The sun is the past, the earth is the present, the moon is the future. From an incandescent mass we have originated, and into a frozen mass we shall turn. Merciless is the law of nature, and rapidly and irresistibly we are drawn to our doom. Lord Kelvin, in his profound meditations, allows us only a short span of life, something like six million years, after which time the suns bright light will have ceased to shine, and its life giving heat will have ebbed away, and our own earth will be a lump of ice, hurrying on through the eternal night. But do not let us despair. There will still be left upon it a glimmering spark of life, and there will be a chance to kindle a new fire on some distant star. This wonderful possibility seems, indeed, to exist, judging from Professor Dewar’s beautiful experiments with liquid air, which show that germs of organic life are not destroyed by cold, no matter how intense; consequently they may be transmitted through the interstellar space. Meanwhile the cheering lights of science and art, ever increasing in intensity, illuminate our path, and marvels they disclose, and the enjoyments they offer, make us measurably forgetful of the gloomy future. Though we may never be able to comprehend human life, we know certainly that it is a movement, of whatever nature it be. The existence of movement unavoidably implies a body which is being moved and a force which is moving it. Hence, wherever there is life, there is a mass moved by a force. All mass possesses inertia, all force tends to persist. Owing to this universal property and condition, a body, be it at rest or in motion, tends to remain in the same state, and a force, manifesting itself anywhere and through whatever cause, produces an equivalent opposing force, and as an absolute necessity of this it follows that every movement in nature must be rhythmical. Long ago this simple truth was clearly pointed out by Herbert Spencer, who arrived at it through a somewhat different process of reasoning. It is borne out in everything we perceive–in the movement of a planet, in the surging and ebbing of the tide, in the reverberations of the air, the swinging of a pendulum, the oscillations of an electric current, and in the infinitely varied phenomena of organic life. Does not the whole of human life attest to it? Birth, growth, old age, and death of an individual, family, race, or nation, what is it all but a rhythm? All life-manifestation, then, even in its most intricate form, as exemplified in man, however involved and inscrutable, is only a movement, to which the same general laws of movement which govern throughout the physical universe must be applicable. Note to Fig. 1. – This result is produced by the discharge of an electrical oscillator giving twelve million volts. The electrical pressure, alternating one hundred thousand times per second, excites the normally inert nitrogen, causing it to combine with the oxygen. The flame-like discharge shown in the photograph measures sixty-five feet across. When we speak of man, we have a conception of humanity as a whole, and before applying scientific methods to, the investigation of his movement we must accept this as a physical fact. But can anyone doubt to-day that all the millions of individuals and all the innumerable types and characters constitute an entity, a unit? Though free to think and act, we are held together, like the stars in the firmament, with ties inseparable. These ties cannot be seen, but we can feel them. I cut myself in the finger, and it pains me: this finger is part of my. I see a friend hurt, and it hurts me, too: my friend and I are one. And now I see stricken down an enemy, a lump of matter which, of all the lumps of matter in the universe, I care least for, and it still grieves me. Does this not prove that each of us is only part of a whole? Conceive, then, man as a mass urged on by a force. Though this movement is not of a translatory character, implying change of place, yet the general laws of mechanical movement are applicable to it, and the energy associated with this mass can be measured, in accordance with well-known principles, by half the product of the mass with the square of a certain velocity. So, for instance, a cannon-ball which is at rest possesses a certain amount of energy in the form of heat, which we measure in a similar way. We imagine the ball to consist of innumerable minute particles, called atoms or molecules, which vibrate or whirl around one another. We determine their masses and velocities, and from them the energy of each of these minute systems, and adding them all together, we get an idea of the total heat-energy contained in the ball, which is only seemingly at rest. In this purely theoretical estimate this energy may then be calculated by multiplying half of the total mass–that is half of the sum of all the small masses–with the square of a velocity which is determined from the velocities of the separate particles. 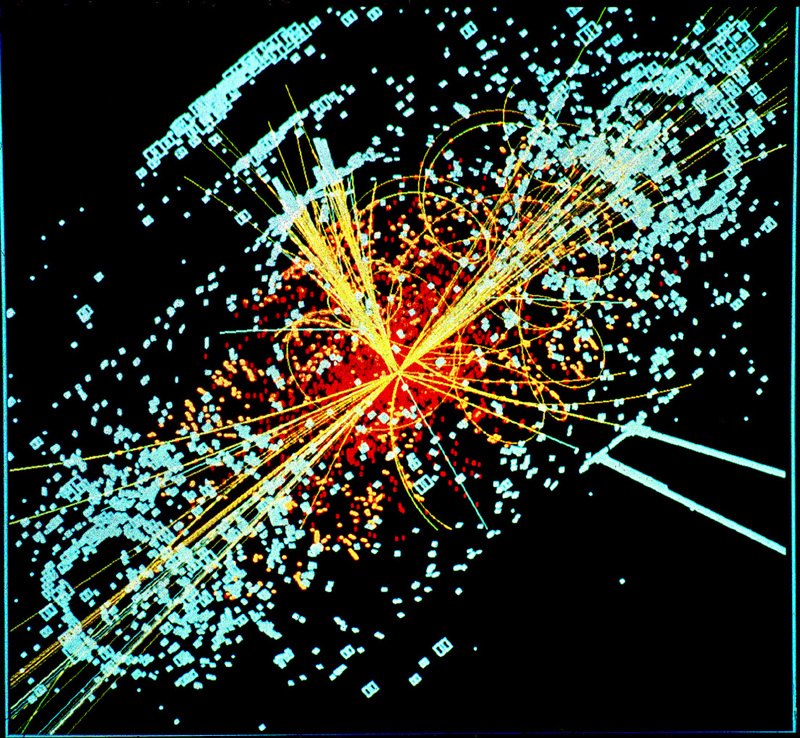 In like manner we may conceive of human energy being measured by half the human mass multiplied with the square of the velocity which we are not yet able to compute. But our deficiency in this knowledge will not vitiate the truth of the deductions I shall draw, which rest on the firm basis that the same laws of mass and force govern throughout nature. Man, however, is not an ordinary mass, consisting of spinning atoms and molecules, and containing merely heat-energy. He is a mass possessed of certain higher qualities by reason of the creative principle of life with which he is endowed. His mass, as the water in an ocean wave, is being continuously exchanged, new taking the place of the old. Not only this, but he grows propagates, and dies, thus altering his mass independently, both in bulk and density. What is most wonderful of all, he is capable of increasing or diminishing his velocity of movement by the mysterious power he possesses by appropriating more or less energy from other substance, and turning it into motive energy. But in any given moment we may ignore these slow changes and assume that human energy is measured by half the product of man’s mass with the square of a certain hypothetical velocity. 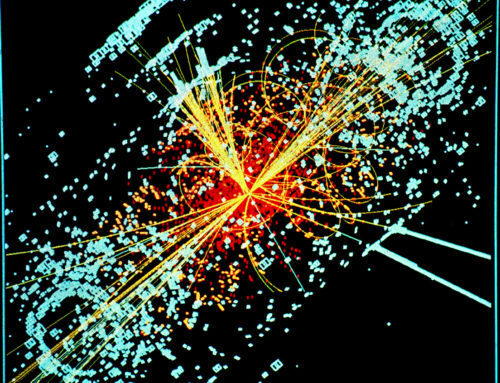 However we may compute this velocity, and whatever we may take as the standard of its measure, we must, in harmony with this conception, come to the conclusion that the great problem of science is, and always will be, to increase the energy thus defined. Many years ago, stimulated by the perusal of that deeply interesting work, Draper’s “History of the Intellectual Development of Europe,” depicting so vividly human movement, I recognized that to solve this eternal problem must ever be the chief task of the man of science. Some results of my own efforts to this end I shall endeavor briefly to describe here. Let, then, in diagram a, M represent the mass of man. This mass is impelled in one direction by a force f, which is resisted by another partly frictional and partly negative force R, acting in a direction exactly opposite, and retarding the movement of the mass. Such an antagonistic force is present in every movement and must be taken into consideration. The difference between these two forces is the effective force which imparts a velocity V to the mass M in the direction of the arrow on the line representing the force f. In accordance with the preceding, the human energy will then be given by the product ½ MV2 = ½ MV x V, in which M is the total mass of man in the ordinary interpretation of the term “mass,” and V is a certain hypothetical velocity, which, in the present state of science, we are unable exactly to define and determine. To increase the human energy is, therefore, equivalent to increasing this product, and there are, as will readily be seen, only three ways possible to attain this result, which are illustrated in the above diagram. The first way shown in the top figure, is to increase the mass (as indicated by the dotted circle), leaving the two opposing forces the same. The second way is to reduce the retarding force R to a smaller value r, leaving the mass and the impelling force the same, as diagrammatically shown in the middle figure. The third way, which is illustrated in the last figure, is to increase the impelling force f to a higher value F, while the mass and the retarding force R remain unaltered. Evidently fixed limits exist as regards increase of mass and reduction of retarding force, but the impelling force can be increased indefinitely. Each of these three possible solutions presents a different aspect of the main problem of increasing human energy, which is thus divided into three distinct problems, to be successively considered. THE FIRST PROBLEM: HOW TO INCREASE THE HUMAN MASS–THE BURNING OF ATMOSPHERIC NITROGEN. Viewed generally, there are obviously two ways of increasing the mass of mankind: first, by aiding and maintaining those forces and conditions which tend to increase it; and, second, by opposing and reducing those which tend to diminish it. The mass will be increased by careful attention to health, by substantial food, by moderation, by regularity of habits, by promotion of marriage, by conscientious attention to children, and, generally stated, by the observance of all the many precepts and laws of religion and hygiene. But in adding new mass to the old, three cases again present themselves. Either the mass added is of the same velocity as the old, or it is of a smaller or of a higher velocity. To gain an idea of the relative importance of these cases, imagine a train composed of, say, one hundred locomotives running on a track, and suppose that, to increase the energy of the moving mass, four more locomotives are added to the train. If these four move at the same velocity at which the train is going, the total energy will be increased four per cent. ; if they are moving at only one half of that velocity, the increase will amount to only one per cent. ; if they are moving at twice that velocity, the increase of energy will be sixteen per cent. This simple illustration shows that it is of greatest importance to add mass of a higher velocity. Stated more to the point, if, for example, the children be of the same degree of enlightenment as the parents,–that is, mass of the “same velocity,”–the energy will simply increase proportionately to the number added. If they are less intelligent or advanced, or mass of “smaller velocity,” there will be a very slight gain in the energy; but if they are further advanced, or mass of “higher velocity,” then the new generation will add very considerably to the sum total of human energy. any addition of mass of “smaller velocity,” beyond that indispensable amount required by the law expressed in the proverb, “Mens sana in corpore sano,” should be strenuously opposed. For instance, the mere development of muscle, as aimed at in some of our colleges, I consider equivalent to adding mass of “smaller velocity,” and I would not commend it, although my views were different when I was a student myself. Moderate exercise, insuring the right balance between mind and body, and the highest efficiency of performance, is, of course, a prime requirement. The above example shows that the most important result to be attained is the education, or the increase of the “velocity,” of the mass newly added. For every person who perishes from the effects of a stimulant, at least a thousand die from the consequences of drinking impure water. This precious fluid, which daily infuses new life into us, is likewise the chief vehicle through which disease and death enter our bodies. The germs of destruction it conveys are enemies all the more terrible as they perform their fatal work unperceived. They seal our doom while we live and enjoy. The majority of people are so ignorant or careless in drinking water, and the consequences of this are so disastrous, that a philanthropist can scarcely use his efforts better than by endeavoring to enlighten those who are thus injuring themselves. By systematic purification and sterilization of the drinkingwater the human mass would be very considerably increased. It should be made a rigid rule–which might be enforced by law–to boil or to sterilize otherwise the drinking water in every household and public place. The mere filtering does not afford sufficient security against infection. All ice for internal uses should be artificially prepared from water thoroughly sterilized. The importance of eliminating germs of disease from the city water is generally recognized, but little is being done to improve the existing conditions, as no satisfactory method of sterilizing great quantities of water has yet been brought forward. By improved electrical appliances we are now enabled to produce ozone cheaply and in large amounts, and this ideal disinfectant seems to offer a happy solution of the important question. Gambling, business rush, and excitement, particularly on the exchanges, are causes of much mass reduction, all the more so because the individuals concerned represent units of higher value. Incapacity of observing the first symptoms of an illness, and careless neglect of the same, are important factors of mortality. In noting carefully every new sign of approaching danger, and making conscientiously every possible effort to avert it, we are not only following wise laws of hygiene in the interest of our well-being and the success of our labors, but we are also complying with a higher moral duty. Everyone should consider his body as a priceless gift from one whom he loves above all, as a marvelous work of art, of undescribable beauty and mastery beyond human conception, and so delicate and frail that a word, a breath, a look, nay, a thought, may injure it. Uncleanliness, which breeds disease and death, is not only a self destructive but highly immoral habit. In keeping our bodies free from infection, healthful, and pure, we are expressing our reverence for the high principle with which they are endowed. He who follows the precepts of hygiene in this spirit is proving himself, so far, truly religious. Laxity of morals is a terrible evil, which poisons both mind and body, and which is responsible for a great reduction of the human mass in some countries. Many of the present customs and tendencies are productive of similar hurtful results. For example, the society life, modern education and pursuits of women, tending to draw them away from their household duties and make men out of them, must needs detract from the elevating ideal they represent, diminish the artistic creative power, and cause sterility and a general weakening of the race. A thousand other evils might be mentioned, but all put together, in their bearing upon the problem under discussion, they could not equal a single one, the want of food, brought on by poverty, destitution, and famine. Millions of individuals die yearly for want of food, thus keeping down the mass. Even in our enlightened communities, and not withstanding the many charitable efforts, this is still, in all probability, the chief evil. I do not mean here absolute want of food, but want of healthful nutriment. How to provide good and plentiful food is, therefore, a most important question of the day. On the general principles the raising of cattle as a means of providing food is objectionable, because, in the sense interpreted above, it must undoubtedly tend to the addition of mass of a “smaller velocity.” It is certainly preferable to raise vegetables, and I think, therefore, that vegetarianism is a commendable departure from the established barbarious habit. That we can subsist on plant food and perform our work even to advantage is not a theory, but a well-demonstrated fact. Many races living almost exclusively on vegetables are of superior physique and strength. There is no doubt that some plant food, such as oatmeal, is more economical than meat, and superior to it in regard to both mechanical and mental performance. Such food, moreover, taxes our digestive organs decidedly less, and, in making us more contented and sociable, produces an amount of good difficult to estimate. In view of these facts every effort should be made to stop the wanton and cruel slaughter of animals, which must be destructive to our morals. To free ourselves from animal instincts and appetites, which keep us down, we should begin at the very root from which we spring: we should effect a radical reform in the character of the food. There seems to be no philosophical necessity for food. We can conceive of organized beings living without nourishment, and deriving all the energy they need for the performance of their lifefunctions from the ambient medium. In a crystal we have the clear evidence of the existence of a formative life-principle, and though we cannot understand the life of a crystal, it is none the less a living being. There may be, besides crystals, other such individualized, material systems of beings, perhaps of gaseous constitution, or composed of substance still more tenuous. In view of this possibility,–nay, probability, we cannot apodictically deny the existence of organized beings on a planet merely because the conditions on the same are unsuitable for the existence of life as we conceive it. We cannot even, with positive assurance, assert that some of them might not be present here, in this our world, in the very midst of us, for their constitution and life-manifestation may be such that we are unable to perceive them. To increase materially the productivity of the soil, it must be more effectively fertilized by artificial means. The question of food-production resolves itself, then, into the question how best to fertilize the soil. What it is that made the soil is still a mystery. To explain its origin is probably equivalent to explaining the origin of life itself. The rocks, disintegrated by moisture and heat and wind and weather, were in themselves not capable of maintaining life. Some unexplained condition arose, and some new principle came into effect, and the first layer capable of sustaining low organisms, like mosses was formed. These, by their life and death, added more of the lifesustaining quality to the soil, and higher organisms could then subsist, and so on and on, until at last highly developed plant and animal life could flourish. But though the theories are, even now, not in agreement as to how fertilization is effected, it is a fact, only too well ascertained, that the soil cannot indefinitely sustain life, and some way must be found to supply it with the substances which have been abstracted from it by the plants. The chief and most valuable among these substances are compounds of nitrogen, and the cheap production of these is, therefore, the key for the solution of the all-important food problem. Our atmosphere contains an inexhaustible amount of nitrogen, and could we but oxidize it and produce these compounds, an incalculable benefit for mankind would follow. Long ago this idea took a powerful hold on the imagination of scientific men, but an efficient means for accomplishing this result could not be devised. The problem was rendered extremely difficult by the extraordinary inertness of the nitrogen, which refuses to combine even with oxygen. But here electricity comes to our aid: the dormant affinities of the element are awakened by an electric current of the proper quality. As a lump of coal which has been in contact with oxygen for centuries without burning will combine with it when once ignited, so nitrogen, excited by electricity, will burn. 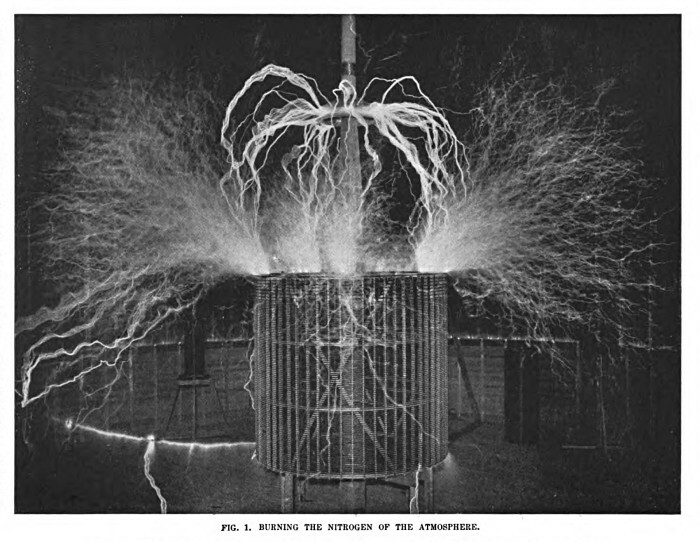 I did not succeed, however, in producing electrical discharges exciting very effectively the atmospheric nitrogen until a comparatively recent date, although I showed, in May, 1891, in a scientific lecture, a novel form of discharge or electrical flame named “St. Elmo’s hotfire,” which, besides being capable of generating ozone in abundance, also possessed, as I pointed out on that occasion, distinctly the quality of exciting chemical affinities. This discharge or flame was then only three or four inches long, its chemical action was likewise very feeble, and consequently the process of oxidation of nitrogen was wasteful. How to intensify this action was the question. Evidently electric currents of a peculiar kind had to be produced in order to render the process of nitrogen combustion more efficient. THE SECOND PROBLEM: HOW TO REDUCE THE FORCE RETARDING THE HUMAN MASS–THE ART OF TELAUTOMATICS. There can be no doubt that, of all the frictional resistances, the one that most retards human movement is ignorance. Not without reason said that man of wisdom, Buddha: “Ignorance is the greatest evil in the world.” The friction which results from ignorance, and which is greatly increased owing to the numerous languages and nationalities, can be reduced only by the spread of knowledge and the unification of the heterogeneous elements of humanity. No effort could be better spent. But however ignorance may have retarded the onward movement of man in times past, it is certain that, nowadays, negative forces have become of greater importance. Among these there is one of far greater moment than any other. It is called organized warfare. When we consider the millions of individuals, often the ablest in mind and body, the flower of humanity, who are compelled to a life of inactivity and unproductiveness, the immense sums of money daily required for the maintenance of armies and war apparatus, representing ever so much of human energy, all the effort uselessly spent in the production of arms and implements of destruction, the loss of life and the fostering of a barbarous spirit, we are appalled at the inestimable loss to mankind which the existence of these deplorable conditions must involve. What can we do to combat best this great evil? It has been argued that the perfection of guns of great destructive power will stop warfare. So I myself thought for a long time, but now I believe this to be a profound mistake. Such developments will greatly modify, but not arrest it. On the contrary, I think that every new arm that is invented, every new departure that is made in this direction, merely invites new talent and skill, engages new effort, offers new incentive, and so only gives a fresh impetus to further development. Think of the discovery of gun-powder. Can we conceive of any more radical departure than was effected by this innovation? Let us imagine ourselves living in that period: would we not have thought then that warfare was at an end, when the armor of the knight became an object of ridicule, when bodily strength and skill, meaning so much before, became of comparatively little value? Yet gunpowder did not stop warfare: quite the opposite–it acted as a most powerful incentive. Nor do I believe that warfare can ever be arrested by any scientific or ideal development, so long as similar conditions to those prevailing now exist, because war has itself become a science, and because war involves some of the most sacred sentiments of which man is capable. In fact, it is doubtful whether men who would not be ready to fight for a high principle would be good for anything at all. It is not the mind which makes man, nor is it the body; it is mind and body. Our virtues and our failings are inseparable, like force and matter. When they separate, man is no more. Again, it is contended by some that the advent of the flying-machine must bring on universal peace. This, too, I believe to be an entirely erroneous view. The flying-machine is certainly coming, and very soon, but the conditions will remain the same as before. In fact, I see no reason why a ruling power, like Great Britain, might not govern the air as well as the sea. Without wishing to put myself on record as a prophet, I do not hesitate to say that the next years will see the establishment of an “air-power,” and its center may be not far from New York. But, for all that, men will fight on merrily. Let us go back to the early beginning, when the law of the stronger was the only law. The light of reason was not yet kindled, and the weak was entirely at the mercy of the strong. The weak individual then began to learn how to defend himself. He made use of a club, stone, spear, sling, or bow and arrow, and in the course of time, instead of physical strength, intelligence became the chief deciding factor in the battle. The wild character was gradually softened by the awakening of noble sentiments, and so, imperceptibly, after ages of continued progress, we have come from the brutal fight of the unreasoning animal to what we call the “civilized warfare” of to-day, in which the combatants shake hands, talk in a friendly way, and smoke cigars in the entr’actes, ready to engage again in deadly conflict at a signal. Let pessimists say what they like, here is an absolute evidence of great and gratifying advance. But now, what is the next phase in this evolution? Not peace as yet, by any means. The next change which should naturally follow from modern developments should be the continuous diminution of the number of individuals engaged in battle. The apparatus will be one of specifically great power, but only a few individuals will be required to operate it. This evolution will bring more and more into prominence a machine or mechanism with the fewest individuals as an element of warfare, and the absolutely unavoidable consequence of this will be the abandonment of large, clumsy, slowly moving, and unmanageable units. Greatest possible speed and maximum rate of energy-delivery by the war apparatus will be the main object. The loss of life will become smaller and smaller, and finally, the number of the individuals continuously diminishing, merely machines will meet in a contest without blood-shed, the nations being simply interested, ambitious spectators. When this happy condition is realized, peace will be assured. But, no matter to what degree of perfection rapid-fire guns, high-power cannon, explosive projectiles, torpedo-boats, or other implements of war may be brought, no matter how destructive they may be made, that condition can never be reached through any such development. All such implements require men for their operation; men are indispensable parts of the machinery. Their object is to kill and to destroy. Their power resides in their capacity for doing evil. So long as men meet in battle, there will be bloodshed. Bloodshed will ever keep up barbarous passion. To break this fierce spirit, a radical departure must be made, an entirely new principle must be introduced, something that never existed before in warfare–a principle which will forcibly, unavoidably, turn the battle into a mere spectacle, a play, a contest without loss of blood. To bring on this result men must be dispensed with: machine must fight machine. But how accomplish that which seems impossible? The answer is simple enough: produce a machine capable of acting as though it were part of a human being–no mere mechanical contrivance, comprising levers, screws, wheels, clutches, and nothing more, but a machine embodying a higher principle, which will enable it to per form its duties as though it had intelligence, experience, judgment, a mind! This conclusion is the result of my thoughts and observations which have extended through virtually my whole life, and I shall now briefly describe how I came to accomplish that which at first seemed an unrealizable dream. A long time ago, when I was a boy, I was afflicted with a singular trouble, which seems to have been due to an extraordinary excitability of the retina. It was the appearance of images which, by their persistence, marred the vision of real objects and interfered with thought. When a word was said to me, the image of the object which it designated would appear vividly before my eyes, and many times it was impossible for me to tell whether the object I saw was real or not. This caused me great discomfort and anxiety, and I tried hard to free myself of the spell. But for a long time I tried in vain, and it was not, as I clearly recollect, until I was about twelve years old that I succeeded for the first time, by an effort of the will, in banishing an image which presented itself. My happiness will never be as complete as it was then, but, unfortunately (as I thought at that time), the old trouble returned, and with it my anxiety. Here it was that the observations to which I refer began. I noted, namely, that whenever the image of an object appeared before my eyes I had seen something that reminded me of it. In the first instances I thought this to be purely accidental, but soon I convinced myself that it was not so. A visual impression, consciously or unconsciously received, invariably preceded the appearance of the image. Gradually the desire arose in me to find out, every time, what caused the images to appear, and the satisfaction of this desire soon became a necessity. The next observation I made was that, just as these images followed as a result of something I had seen, so also the thoughts which I conceived were suggested in like manner. Again, I experienced the same desire to locate the image which caused the thought, and this search for the original visual impression soon grew to be a second nature. Mt mind became automatic, as it were, and in the course of years of continued, almost unconscious performance, I acquired the ability of locating every time and, as a rule, instantly the visual impression which started the thought. Nor is this all. It was not long before I was aware that also all my movements were prompted in the same way, and so, searching, observing, and verifying continuously, year by year, I have, by every thought and every act of mine, demonstrated, and do so daily, to my absolute satisfaction, that I am an automaton endowed with power of movement, which merely responds to external stimuli beating upon my sense organs, and thinks and acts and moves accordingly. I remember only one or two cases in all my life in which I was unable to locate the first impression which prompted a movement or a thought, or even a dream. FIG. 2. 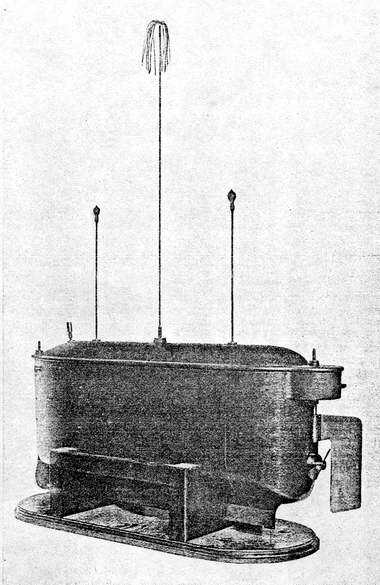 THE FIRST PRACTICAL TELEAUTOMATON. With these experiences it was only natural that, long ago, I conceived the idea of constructing an automaton which would mechanically represent me, and which would respond, as I do myself, but, of course, in a much more primitive manner, to external influences. Such an automaton evidently had to have motive power, organs for locomotion, directive organs, and one or more sensitive organs so adapted as to be excited by external stimuli. This machine would, I reasoned, perform its movements in the manner of a living being, for it would have all the chief mechanical characteristics or elements of the same. There was still the capacity for growth, propagation, and, above all, the mind which would be wanting to make the model complete. But growth was not necessary in this case, since a machine could be manufactured fullgrown, so to speak. As to the capacity for propagation, it could likewise be left out of consideration, for in the mechanical model it merely signified a process of manufacture. Whether the automation be of flesh and bone, or of wood and steel, it mattered little, provided it could perform all the duties required of it like an intelligent being. To do so, it had to have an element corresponding to the mind, which would effect the control of all its movements and operations, and cause it to act, in any unforseen case that might present itself, with knowledge, reason, judgement, and experience. But this element I could easily embody in it by conveying to it my own intelligence, my own understanding. So this invention was evolved, and so a new art came into existence, for which the name “telautomatics” has been suggested, which means the art of controlling the movements and operations of distant automatons. This principle evidently was applicable to any kind of machine that moves on land or in the water or in the air. In applying it practically for the first time, I selected a boat (see Fig. 2). A storage battery placed within it furnished the motive power. The propeller, driven by a motor, represented the locomotive organs. The rudder, controlled by another motor likewise driven by the battery, took the place of the directive organs. As to the sensitive organ, obviously the first thought was to utilize a device responsive to rays of light, like a selenium cell, to represent the human eye. But upon closer inquiry I found that, owing to experimental and other difficulties, no thoroughly satisfactory control of the automaton could be effected by light, radiant heat, hertzian radiations, or by rays in general, that is, disturbances which pass in straight lines through space. One of the reasons was that any obstacle coming between the operator and the distant automaton would place it beyond his control. Another reason was that the sensitive device representing the eye would have to be in a definite position with respect to the distant controlling apparatus, and this necessity would impose great limitations in the control. Still another and very important reason was that, in using rays, it would be difficult, if not impossible, to give to the automaton individual features or characteristics distinguishing it from other machines of this kind. Evidently the automaton should respond only to an individual call, as a person responds to a name. Such considerations led me to conclude that the sensitive device of the machine should correspond to the ear rather than the eye of a human being, for in this case its actions could be controlled irrespective of intervening obstacles, regardless of its position relative to the distant controlling apparatus, and, last, but not least, it would remain deaf and unresponsive, like a faithful servant, to all calls but that of its master. Theserequirements made it imperative to use, in the control of the automaton, instead of light or other rays, waves or disturbances which propagate in all directions through space, like sound, or which follow a path of least resistance, however curved. I attained the result aimed at by means of an electric circuit placed within the boat, and adjusted, or “tuned,” exactly to electrical vibrations of the proper kind transmitted to it from a distant “electrical oscillator.” This circuit, in responding, however feebly, to the transmitted vibrations, affected magnets and other contrivances, through the medium of which were controlled the movements of the propeller and rudder, and also the operations of numerous other appliances. By the simple means described the knowledge, experience, judgement–the mind, so to speak–of the distant operator were embodied in that machine, which was thus enabled to move and to perform all its operations with reason and intelligence. It behaved just like a blindfolded person obeying directions received through the ear. The automatons so far constructed had “borrowed minds,” so to speak, as each merely formed part of the distant operator who conveyed to it his intelligent orders; but this art is only in the beginning. I purpose to show that, however impossible it may now seem, an automaton may be contrived which will have its “own mind,” and by this I mean that it will be able, independent of any operator, left entirely to itself, to perform, in response to external influences affecting its sensitive organs, a great variety of acts and operations as if it had intelligence. It will be able to follow a course laid out or to obey orders given far in advance; it will be capable of distinguishing between what it ought and what it ought not to do, and of making experiences or, otherwise stated, of recording impressions which will definitely affect its subsequent actions. In fact, I have already conceived such a plan. Although I evolved this invention many years ago and explained it to my visitors very frequently in my laboratory demonstrations, it was not until much later, long after I had perfected it, that it became known, when, naturally enough, it gave rise to much discussion and to sensational reports. But the true significance of this new art was not grasped by the majority, nor was the great force of the underlying principle recognized. As nearly as I could judge from the numerous comments which appeared, the results I had obtained were considered as entirely impossible. Even the few who were disposed to admit the practicability of the invention saw in it merely an automobile torpedo, which was to be used for the purpose of blowing up battleships, with doubtful success. The general impression was that I contemplated simply the steering of such a vessel by means of Hertzian or other rays. There are torpedoes steered electrically by wires, and there are means of communicating without wires, and the above was, of course an obvious inference. Had I accomplished nothing more than this, I should have made a small advance indeed. But the art I have evolved does not contemplate merely the change of direction of a moving vessel; it affords means of absolutely controlling, in every respect, all the innumerable translatory movements, as well as the operations of all the internal organs, no matter how many, of an individualized automaton. Criticisms to the effect that the control of the automaton could be interfered with were made by people who do not even dream of the wonderful results which can be accomplished by use of electrical vibrations. The world moves slowly, and new truths are difficult to see. Certainly, by the use of this principle, an arm for attack as well as defense may be provided, of a destructiveness all the greater as the principle is applicable to submarine and aërial vessels. There is virtually no restriction as to the amount of explosive it can carry, or as to the distance at which it can strike, and failure is almost impossible. But the force of this new principle does not wholly reside in its destructiveness. Its advent introduces into warfare an element which never existed before–a fighting-machine without men as a means of attack and defense. The continuous development in this direction must ultimately make war a mere contest of machines without men and without loss of life–a condition which would have been impossible without this new departure, and which, in my opinion, must be reached as preliminary to permanent peace. The future will either bear out or disprove these views. My ideas on this subject have been put forth with deep conviction, but in a humble spirit. THE THIRD PROBLEM: HOW TO INCREASE THE FORCE ACCELERATING THE HUMAN MASS – THE HARNESSING OF THE SUN’S ENERGY. Of the three possible solutions of the main problem of increasing human energy, this is by far the most important to consider, not only because of its intrinsic significance, but also because of its intimate bearing on all the many elements and conditions which determine the movement of humanity. In order to proceed systematically, it would be necessary for me to dwell on all those considerations which have guided me from the outset in my efforts to arrive at a solution, and which have led me, step by step, to the results I shall now describe. As a preliminary study of the problem an analytical investigation, such as I have made, of the chief forces which determine the onward movement, would be of advantage, particularly in conveying an idea of that hypothetical “velocity” which, as explained in the beginning, is a measure of human energy; but to deal with this specifically here, as I would desire, would lead me far beyond the scope of the present subject. Suffice it to state that the resultant of all these forces is always in the direction of reason, which therefore, determines, at any time, the direction of human movement. This is to say that every effort which is scientifically applied, rational, useful, or practical, must be in the direction in which the mass is moving. The practical, rational man, the observer, the man of business, he who reasons, calculates, or determines in advance, carefully applies his effort so that when coming into effect it will be in the direction of the movement, making it thus most efficient, and in this knowledge and ability lies the secret of his success. Every new fact discovered, every new experience or new element added to our knowledge and entering into the domain of reason, affects the same and, therefore, changes the direction of movement, which, however, must always take place along the resultant of all those efforts which, at that time, we designate as reasonable, that is, self-preserving, useful, profitable, or practical. These efforts concern our daily life, our necessities and comforts, our work and business, and it is these which drive man onward. THE SOURCE OF HUMAN ENERGY – THE THREE WAYS OF DRAWING ENERGY FROM THE SUN. First let us ask: Whence comes all the motive power? What is the spring that drives all? We see the ocean rise and fall, the rivers flow, the wind, rain, hail, and snow beat on our windows, the trains and steamers come and go; we here the rattling noise of carriages, the voices from the street; we feel, smell, and taste; and we think of all this. And all this movement, from the surging of the mighty ocean to that subtle movement concerned in our thought, has but one common cause. All this energy emanates from one single center, one single source–the sun. The sun is the spring that drives all. The sun maintains all human life and supplies all human energy. Another answer we have now found to the above great question: To increase the force accelerating human movement means to turn to the uses of man more of the sun’s energy. We honor and revere those great men of bygone times whose names are linked with immortal achievements, who have proved themselves benefactors of humanity–the religious reformer with his wise maxims of life, the philosopher with his deep truths, the mathematician with his formulæ, the physicist with his laws, the discover with his principles and secrets wrested from nature, the artist with his forms of the beautiful; but who honors him, the greatest of all,–who can tell the name of him,–who first turned to use the sun’s energy to save the effort of a weak fellow-creature? That was man’s first act of scientific philanthropy, and its consequences have been incalculable. From the very beginning three ways of drawing energy from the sun were open to man. The savage, when he warmed his frozen limbs at a fire kindled in some way, availed himself of the energy of the sun stored in the burning material. When he carried a bundle of branches to his cave and burned them there, he made use of the sun’s stored energy transported from one to another locality. When he set sail to his canoe, he utilized the energy of the sun applied to the atmosphere or the ambient medium. There can be no doubt that the first is the oldest way. A fire, found accidentally, taught the savage to appreciate its beneficial heat. He then very likely conceived of the idea of carrying the glowing members to his abode. Finally he learned to use the force of a swift current of water or air. It is characteristic of modern development that progress has been effected in the same order. The utilization of the energy stored in wood or coal, or, generally speaking, fuel, led to the steam-engine. Next a great stride in advance was made in energy-transportation by the use of electricity, which permitted the transfer of energy from one locality to another without transporting the material. But as to the utilization of the energy of the ambient medium, no radical step forward has as yet been made known. The ultimate results of development in these three directions are: first, the burning of coal by a cold process in a battery; second, the efficient utilization of the energy of the ambient medium; and, third the transmission without wires of electrical energy to any distance. In whatever way these results may be arrived at, their practical application will necessarily involve an extensive use of iron, and this invaluable metal will undoubtedly be an essential element in the further development along these three lines. If we succeed in burning coal by a cold process and thus obtain electrical energy in an efficient and inexpensive manner, we shall require in many practical uses of this energy electric motors–that is, iron. If we are successful in deriving energy from the ambient medium, we shall need, both in the obtainment and utilization of the energy, machinery–again, iron. If we realize the transmission of electrical energy without wires on an industrial scale, we shall be compelled to use extensively electric generators–once more, iron. Whatever we may do, iron will probably be the chief means of accomplishment in the near future, possibly more so than in the past. How long its reign will last is difficult to tell, for even now aluminium is looming up as a threatening competitor. But for the time being, next to providing new resources of energy, it is of the greatest importance to making improvements in the manufacture and utilization of iron. Great advances are possible in these latter directions, which, if brought about, would enormously increase the useful performance of mankind. GREAT POSSIBILITIES OFFERED BY IRON FOR INCREASING HUMAN PERFORMANCE – ENORMOUS WASTE IN IRON MANUFACTURE. Iron is by far the most important factor in modern progress. It contributes more than any other industrial product to the force accelerating human movement. So general is the use of this metal, and so intimately is it connected with all that concerns our life, that it has become as indispensable to us as the very air we breathe. Its name is synonymous with usefulness. But, however great the influence of iron may be on the present human development, it does not add to the force urging man onward nearly as much as it might. First of all, its manufacture as now carried on is connected with an appalling waste of fuel–that is, waste of energy. Then, again, only a part of all the iron produced is applied for useful purposes. A good part of it goes to create frictional resistances, while still another large part is the means of developing negative forces greatly retarding human movement. Thus the negative force of war is almost wholly represented in iron. It is impossible to estimate with any degree of accuracy the magnitude of this greatest of all retarding forces, but it is certainly very considerable. If the present positive impelling force due to all useful applications of iron be represented by ten, for instance, I should not think it exaggeration to estimate the negative force of war, with due consideration of all its retarding influences and results, at, say, six. On the basis of this estimate the effective impelling force of iron in the positive direction would be measured by the difference of these two numbers, which is four. But if, through the establishment of universal peace, the manufacture of war machinery should cease, and all struggle for supremacy between nations should be turned into healthful, ever active and productive commercial competition, then the positive impelling force due to iron would be measured by the sum of those two, numbers, which is sixteen–that is, this force would have four times its present value. This example is, of course, merely intended to give an idea of the immense increase in the useful performance of mankind which would result from a radical reform of the iron industries supplying the implements of warfare. A similar inestimable advantage in the saving of energy available to man would be secured by obviating the great waste of coal which is inseparably connected with the present methods of manufacturing iron. In some countries, such as Great Britain, the hurtful effects of this squandering of fuel are beginning to be felt. The price of coal is constantly rising, and the poor are made to suffer more and more. Though we are still far from the dreaded “exhaustion of the coal-fields,” philanthropy commands us to invent novel methods of manufacturing iron, which will not involve such barbarous waste of this valuable material from which we derive at present most of our energy. It is our duty to coming generations to leave this store of energy intact for them, or at least not to touch it until we shall have perfected processes for burning coal more efficiently. Those who are coming after us will need fuel more than we do. We should be able to manufacture the iron we require by using the sun’s energy, without wasting any coal at all. As an effort to this end the idea of smelting iron ores by electric currents obtained from the energy of falling water has naturally suggested itself to many. I have myself spent much time in endeavoring to evolve such a practical process, which would enable iron to be manufactured at small cost. After a prolonged investigation of the subject, finding that it was unprofitable to use the currents generated directly for smelting the ore, I devised a method which is far more economical. Up to a few decades ago the usefulness of iron was based almost wholly on its remarkable mechanical properties, but since the advent of the commercial dynamo and electric motor its value to mankind has been greatly increased by its unique magnetic qualities. As regards the latter, iron has been greatly improved of late. The signal progress began about thirteen years ago, when I discovered that in using soft Bessemer steel instead of wrought iron, as then customary, in an alternating motor, the performance of the machine was doubled. I brought this fact to the attention of Mr. Albert Schmid, to whose untiring efforts and ability is largely due the supremacy of American electrical machinery, and who was then superintendent of an industrial corporation engaged in this field. Following my suggestion, he constructed transformers of steel, and they showed the same marked improvement. The investigation was then systematically continued under Mr. Schmid’s guidance, the impurities being gradually eliminated from the “steel” (which was only such in name, for in reality it was pure soft iron), and soon a product resulted which admitted of little further improvement. THE COMING OF AGE OF ALUMINIUM – DOOM OF THE COPPER INDUSTRY–THE GREAT CIVILIZING POTENCY OF THE NEW METAL. The absolutely unavoidable consequence of the advancement of the aluminium industry will be the annihilation of the copper industry. They cannot exist and prosper to-gether, and the latter is doomed beyond any hope of recovery. Even now it is cheaper to convey an electric current through aluminium wires than through copper wires; aluminium castings cost less, and in many domestic and other uses copper has no chance of successfully competing. A further material reduction of the price of aluminium cannot but be fatal to copper. But the progress of the former will not go on unchecked, for, as it ever happens in such cases, the larger industry will absorb the smaller one: the giant copper interests will control the pygmy aluminium interests, and the slow-pacing copper will reduce the lively gait of aluminium. This will only delay, not avoid the impending catastrophe. EFFORTS TOWARD OBTAINING MORE ENERGY FROM COAL–THE ELECTRIC TRANSMISSION–THE GAS-ENGINE–THE COLD-COAL BATTERY. I remember that at one time I considered the production of electricity by burning coal in a battery as the greatest achievement toward the advancing civilization, and I am surprised to find how much the continuous study of these subjects has modified my views. It now seems to me that to burn coal, however efficiently, in a battery would be a mere makeshift, a phase in the evolution toward something much more perfect. After all, in generating electricity in this manner, we should be destroying material, and this would be a barbarous process. We ought to be able to obtain the energy we need without consumption of material. But I am far from underrating the value of such an efficient method of burning fuel. At the present time most motive power comes from coal, and, either directly or by its products, it adds vastly to human energy. Unfortunately, in all the process now adopted, the larger portion of the energy of the coal is uselessly dissipated. The best steam-engines utilize only a small part of the total energy. Even in gas-engines, in which, particularly of late, better results are obtainable, there is still a barbarous waste going on. In our electric-lighting systems we scarcely utilize one third of one per cent., and in lighting by gas a much smaller fraction, of the total energy of the coal. Considering the various uses of coal throughout the world, we certainly do not utilize more than two per cent. of its energy theoretically available. The man who should stop this senseless waste would be a great benefactor of humanity, though the solution he would offer could not be a permanent one, since it would ultimately lead to the exhaustion of the store of material. Efforts toward obtaining more energy from coal are now being made chiefly in two directions–by generating electricity and by producing gas for motive-power purposes. In both of these lines notable success has already been achieved. But all such improvements cannot be more than passing phases in the evolution toward something far more perfect, for ultimately we must succeed in obtaining electricity from coal in a more direct way, involving no great loss of heat-energy. Whether coal can be oxidized by a cold process is still a question. Its combination with oxygen always involves heat, and whether the energy of the combination of the carbon with another element can be turned directly into electrical energy has not yet been determined. Under certain conditions nitric acid will burn the carbon, generating an electric current, but the solution does not remain cold. Other means of oxidizing coal have been proposed, but they have offered no promise of leading to an efficient process. My own lack of success has been complete, though perhaps not quite so complete as that of some who have “perfected” the cold-coal battery. This problem is essentially one for the chemist to solve. It is not for the physicist, who determines all his results in advance, so that, when the experiment is tried, it cannot fail. Chemistry, though a positive science, does not yet admit of a solution by such positive methods as those which are available in the treatment of many physical problems. The result, if possible, will be arrived at through patent trying rather than through deduction or calculation. The time will soon come, however, when the chemist will be able to follow a course clearly mapped out beforehand, and when the process of his arriving at a desired result will be purely constructive. The cold-coal battery would give a great impetus to electrical development; it would lead very shortly to a practical flying-machine, and would enormously enhance the introduction of the automobile. But these and many other problems will be better solved, and in a more scientific manner, by a light storage battery. ENERGY FROM THE MEDIUM–THE WINDMILL AND THE SOLAR ENGINE,–MOTIVE POWER FROM TERRESTRIAL HEAT–ELECTRICITY FROM NATURAL SOURCES. But, whatever our resources of primary energy may be in the future, we must, to be rational, obtain it without consumption of any material. Long ago I came to this conclusion, and to arrive at this result only two ways, as before indicated, appeared possible — either to turn to use the energy of the sun stored in the ambient medium, or to transmit, through the medium, the sun’s energy to distant places from some locality where it was obtainable without consumption of material. At that time I at once rejected the latter method as entirely impracticable, and turned to examine the possibilities of the former. It is difficult to believe, but it is, nevertheless, a fact, that since time immemorial man has had at his disposal a fairly good machine which has enabled him to utilize the energy of the ambient medium. This machine is the windmill. Contrary to popular belief, the power obtainable from wind is very considerable. Many a deluded inventor has spent years of his life in endeavoring to “harness the tides,” and some have even proposed to compress air by tide- or wave-power for supplying energy, never understanding the signs of the old windmill on the hill, as it sorrowfully waved its arms about and bade them stop. The fact is that a wave- or tide-motor would have, as a rule, but a small chance of competing commercially with the windmill, which is by far the better machine, allowing a much greater amount of energy to be obtained in a simpler way. Wind-power has been, in old times, of inestimable value to man, if for nothing else but for enabling him, to cross the seas, and it is even now a very important factor in travel and transportation. But there are great limitations in this ideally simple method of utilizing the sun’s energy. The machines are large for a given output, and the power is intermittent, thus necessitating the storage of energy and increasing the cost of the plant. A far better way, however, to obtain power would be to avail ourselves of the sun’s rays, which beat the earth incessantly and supply energy at a maximum rate of over four million horsepower per square mile. Although the average energy received per square mile in any locality during the year is only a small fraction of that amount, yet an inexhaustible source of power would be opened up by the discovery of some efficient method of utilizing the energy of the rays. The only rational way known to me at the time when I began the study of this subject was to employ some kind of heat- or thermodynamic-engine, driven by a volatile fluid evaporate in a boiler by the heat of the rays. But closer investigation of this method, and calculation, showed that, notwithstanding the apparently vast amount of energy received from the sun’s rays, only a small fraction of that energy could be actually utilized in this manner. Furthermore, the energy supplied through the sun’s radiations is periodical, and the same limitations as in the use of the windmill I found to exist here also. After a long study of this mode of obtaining motive power from the sun, taking into account the necessarily large bulk of the boiler, the low efficiency of the heat-engine, the additional cost of storing the energy and other drawbacks, I came to the conclusion that the “solar engine,” a few instances excepted, could not be industrially exploited with success. It is possible, and even probable, that there will be, in time, other resources of energy opened up, of which we have no knowledge now. We may even find ways of applying forces such as magnetism or gravity for driving machinery without using any other means. Such realizations, though highly improbable, are not impossible. An example will best convey an idea of what we can hope to attain and what we can never attain. Imagine a disk of some homogeneous material turned perfectly true and arranged to turn in frictionless bearings on a horizontal shaft above the ground. This disk, being under the above conditions perfectly balanced, would rest in any position. 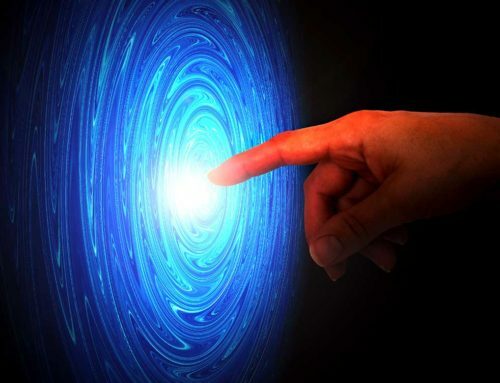 Now, it is possible that we may learn how to make such a disk rotate continuously and perform work by the force of gravity without any further effort on our part; but it is perfectly impossible for the disk to turn and to do work without any force from the outside. If it could do so, it would be what is designated scientifically as a “perpetuum mobile,” a machine creating its own motive power. To make the disk rotate by the force of gravity we have only to invent a screen against this force. By such a screen we could prevent this force from acting on one half of the disk, and the rotation of the latter would follow. At least, we cannot deny such a possibility until we know exactly the nature of the force of gravity. Suppose that this force were due to a movement comparable to that of a stream of air passing from above toward the center of the earth. The effect of such a stream upon both halves of the disk would be equal, and the latter would not rotate ordinarily; but if one half should be guarded by a plate arresting the movement, then it would turn. A DEPARTURE FROM KNOWN METHODS–POSSIBILITY OF A “SELF-ACTING” ENGINE OR MACHINE, INANIMATE, YET CAPABLE, LIKE A LIVING BEING, OF DERIVING ENERGY FROM THE MEDIUM–THE IDEAL WAY OF OBTAINING MOTIVE POWER. I was vainly endeavoring to form an idea of how this might be accomplished, when I read some statements from Carnot and Lord Kelvin (then Sir William Thomson) which meant virtually that it is impossible for an inanimate mechanism or self-acting machine to cool a portion of the medium below the temperature of the surrounding, and operate by the heat abstracted. These statements interested me intensely. Evidently a living being could do this very thing, and since the experiences of my early life which I have related had convinced me that a living being is only an automaton, or, otherwise stated, a “self-acting-engine,” I came to the conclusion that it was possible to construct a machine which would do the same. As the first step toward this realization I conceived the following mechanism. Imagine a thermopile consisting of a number of bars of metal extending from the earth to the outer space beyond the atmosphere. The heat from below, conducted upward along these metal bars, would cool the earth or the sea or the air, according to the location of the lower parts of the bars, and the result, as is well known, would be an electric current circulating in these bars. The two terminals of the thermopile could now be joined through an electric motor, and, theoretically, this motor would run on and on, until the media below would be cooled down to the temperature of the outer space. This would be an inanimate engine which, to all evidence, would be cooling a portion of the medium below the temperature of the surrounding, and operating by the heat abstracted. But was it not possible to realize a similar condition without necessarily going to a height? Conceive, for the sake of illustration, [a cylindrical] enclosure T, as illustrated in diagram b, such that energy could not be transferred across it except through a channel or path O, and that, by some means or other, in this enclosure a medium were maintained which would have little energy, and that on the outer side of the same there would be the ordinary ambient medium with much energy. Under these assumptions the energy would flow through the path O, as indicated by the arrow, and might then be converted on its passage into some other form of energy. The question was, Could such a condition be attained? Could we produce artificially such a “sink” for the energy of the ambient medium to flow in? Suppose that an extremely low temperature could be maintained by some process in a given space; the surrounding medium would then be compelled to give off heat, which could be converted into mechanical or other form of energy, and utilized. By realizing such a plan, we should be enabled to get at any point of the globe a continuous supply of energy, day and night. More than this, reasoning in the abstract, it would seem possible to cause a quick circulation of the medium, and thus draw the energy at a very rapid rate. Here, then, was an idea which, if realizable, afforded a happy solution of the problem of getting energy from the medium. But was it realizable? I convinced myself that it was so in a number of ways, of which one is the following. As regards heat, we are at a high level, which may be represented by the surface of a mountain lake considerably above the sea, the level of which may mark the absolute zero of temperature existing in the interstellar space. Heat, like water, flows from high to low level, and, consequently, just as we can let the water of the lake run down to the sea, so we are able to let heat from the earth’s surface travel up into the cold region above. Heat, like water, can perform work in flowing down, and if we had any doubt as to whether we could derive energy from the medium by means of a thermopile, as before described, it would be dispelled by this analogue. But can we produce cold in a given portion of the space and cause the heat to flow in continually? To create such a “sink,” or “cold hole,” as we might say, in the medium, would be equivalent to producing in the lake a space either empty or filled with something much lighter than water. This we could do by placing in the lake a tank, and pumping all the water out of the latter. We know, then, that the water, if allowed to flow back into the tank, would, theoretically, be able to perform exactly the same amount of work which was used in pumping it out, but not a bit more. Consequently nothing could be gained in this double operation of first raising the water and then letting it fall down. This would mean that it is impossible to create such a sink in the medium. But let us reflect a moment. Heat, though following certain general laws of mechanics, like a fluid, is not such; it is energy which may be converted into other forms of energy as it passes from a high to a low level. To make our mechanical analogy complete and true, we must, therefore, assume that the water, in its passage into the tank, is converted into something else, which may be taken out of it without using any, or by using very little, power. For example, if heat be represented in this analogue by the water of the lake, the oxygen and hydrogen composing the water may illustrate other forms of energy into which the heat is transformed in passing from hot to cold. If the process of heat transformation were absolutely perfect, no heat at all would arrive at the low level, since all of it would be converted into other forms of energy. Corresponding to this ideal case, all the water flowing into the tank would be decomposed into oxygen and hydrogen before reaching the bottom, and the result would be that water would continually flow in, and yet the tank would remain entirely empty, the gases formed escaping. We would thus produce, by expending initially a certain amount of work to create a sink for the heat or, respectively, the water to flow in, a condition enabling us to get any amount of energy without further effort. This would be an ideal way of obtaining motive power. We do not know of any such absolutely perfect process of heat-conversion, and consequently some heat will generally reach the low level, which means to say, in our mechanical analogue, that some water will arrive at the bottom of the tank, and a gradual and slow filling of the latter will take place, necessitating continuous pumping out. But evidently there will be less to pump out than flows in, or, in other words, less energy will be needed to maintain the initial condition than is developed by the fall, and this is to say that some energy will be gained from the medium. What is not converted in flowing down can just be raised up with its own energy, and what is converted is clear gain. Thus the virtue of the principle I have discovered resides wholly in the conversion of the energy on the downward flow. 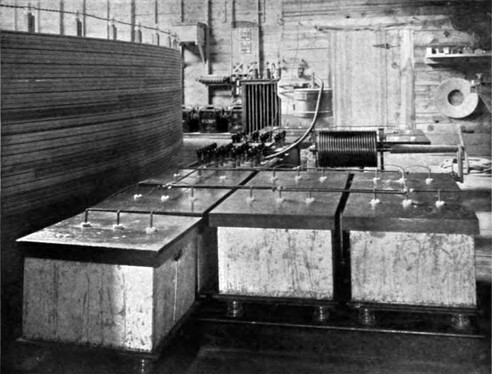 FIRST EFFORTS TO PRODUCE THE SELF-ACTING ENGINE–THE MECHANICAL OSCILLATOR–WORK OF DEWAR AND LINDE–LIQUID AIR. Having recognized this truth, I began to devise means for carrying out my idea, and, after long thought, I finally conceived a combination of apparatus which should make possible the obtaining of power from the medium by a process of continuous cooling of atmospheric air. This apparatus, by continually transforming heat into mechanical work, tended to become colder and colder, and if it only were practicable to reach a very low temperature in this manner, then a sink for the heat could be produced, and energy could be derived from the medium. This seemed to be contrary to the statements of Carnot and Lord Kelvin before referred to, but I concluded from the theory of the process that such a result could be attained. This conclusion I reached, I think, in the latter part of 1883, when I was in Paris, and it was at a time when my mind was being more and more dominated by an invention which I had evolved during the preceding year, and which has since become known under the name of the “rotating magnetic field.” During the few years which followed I elaborated further the plan I had imagined, and studied the working conditions, but made little headway. The commercial introduction in this country of the invention before referred to required most of my energies until 1889, when I again took up the idea of the self-acting machine. A closer investigation of the principles involved, and calculation, now showed that the result I aimed at could not be reached in a practical manner by ordinary machinery, as I had in the beginning expected. This led me, as a next step, to the study of a type of engine generally designated as “turbine,” which at first seemed to offer better chances for a realization of the idea. Soon I found, however, that the turbine, too, was unsuitable. But my conclusions showed that if an engine of a peculiar kind could be brought to a high degree of perfection, the plan I had conceived was realizable, and I resolved to proceed with the development of such an engine, the primary object of which was to secure the greatest economy of transformation of heat into mechanical energy. A characteristic feature of the engine was that the work-performing piston was not connected with anything else, but was perfectly free to vibrate at an enormous rate. The mechanical difficulties encountered in the construction of this engine were greater than I had anticipated, and I made slow progress. This work was continued until early in 1892, when I went to London, where I saw Professor Dewar’s admirable experiments with liquefied gases. Others had liquefied gases before, and notably Ozlewski and Pictet had performed creditable early experiments in this line, but there was such a vigor about the work of Dewar that even the old appeared new. His experiments showed, though in a way different from that I had imagined, that it was possible to reach a very low temperature by transforming heat into mechanical work, and I returned, deeply impressed with what I had seen, and more than ever convinced that my plan was practicable. The work temporarily interrupted was taken up anew, and soon I had in a fair state of perfection the engine which I have named “the mechanical oscillator.” In this machine I succeeded in doing away with all packings, valves, and lubrication, and in producing so rapid a vibration of the piston that shafts of tough steel, fastened to the same and vibrated longitudinally, were torn asunder. By combining this engine with a dynamo of special design I produced a highly efficient electrical generator, invaluable in measurements and determinations of physical quantities on account of the unvarying rate of oscillation obtainable by its means. I exhibited several types of this machine, named “mechanical and electrical oscillator,” before the Electrical Congress at the World’s Fair in Chicago during the summer of 1893, in a lecture which, on account of other pressing work, I was unable to prepare for publication. On that occasion I exposed the principles of the mechanical oscillator, but the original purpose of this machine is explained here for the first time. The liquefaction of air by a self-cooling process was not, as popularly believed, an accidental discovery, but a scientific result which could not have been delayed much longer, and which, in all probability, could not have escaped Dewar. This fascinating advance, I believe, is largely due to the powerful work of this great Scotchman. Nevertheless, Linde’s is an immortal achievement. The manufacture of liquid air has been carried on for four years in Germany, on a scale much larger than in any other country, and this strange product has been applied for a variety of purposes. Much was expected of it in the beginning, but so far it has been an industrial ignis fatuus. By the use of such machinery as I am perfecting, its cost will probably be greatly lessened, but even then its commercial success will be questionable. When, used as a refrigerant it is uneconomical, as its temperature is unnecessarily low. It is as expensive to maintain a body at a very low temperature as it is to keep it very hot; it takes coal to keep air cold. In oxygen manufacture it cannot yet compete with the electrolytic method. For use as an explosive it is unsuitable, because its low temperature again condemns it to a small efficiency, and for motive-power purposes its cost is still by far too high. It is of interest to note, however, that in driving an engine by liquid air a certain amount of energy may be gained from the engine, or, stated otherwise, from the ambient medium which keeps the engine warm, each two hundred pounds of iron-casting of the latter contributing energy at the rate of about one effective horsepower during one hour. But this gain of the consumer is offset by an equal loss of the producer. DISCOVERY OF UNEXPECTED PROPERTIES OF THE ATMOSPHERE–STRANGE EXPERIMENTS–TRANSMISSION OF ELECTRICAL ENERGY THROUGH ONE WIRE WITHOUT RETURN–TRANSMISSION THROUGH THE EARTH WITHOUT ANY WIRE. Another of these reasons was that I was led to recognize the transmission of electrical energy to any distance through the media as by far the best solution of the great problem of harnessing the sun’s energy for the uses of man. For a long time I was convinced that such a transmission on an industrial scale, could never be realized, but a discovery which I made changed my view. I observed that under certain conditions the atmosphere, which is normally a high insulator, assumes conducting properties, and so becomes capable of conveying any amount of electrical energy. But the difficulties in the way of a practical utilization of this discovery for the purpose of transmitting electrical energy without wires were seemingly insuperable. 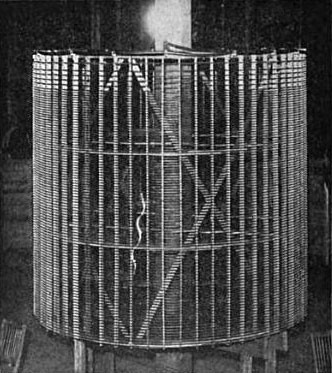 Electrical pressures of many millions of volts had to be produced and handled; generating apparatus of a novel kind, capable of withstanding the immense electrical stresses, had to be invented and perfected, and a complete safety against the dangers of the high-tension currents had to be attained in the system before its practical introduction could be even thought of. All this could not be done in a few weeks or months, or even years. The work required patience and constant application, but the improvements came, though slowly. Other valuable results were, however, arrived at in the course of this long-continued work, of which I shall endeavor to give a brief account, enumerating the chief advances as they were successively effected. The discovery of the conducting properties of the air, though unexpected, was only a natural result of experiments in a special field which I had carried on for some years before. It was, I believe, during 1889 that certain possibilities offered by extremely rapid electrical oscillations determined me to design a number of special machines adapted for their investigation. Owing to the peculiar requirements, the construction of these machines was very difficult, and consumed much time and effort; but my work on them was generously rewarded, for I reached by their means several novel and important results. One of the earliest observations I made with these new machines was that electrical oscillations of an extremely high rate act in an extraordinary manner upon the human organism. Thus, for instance, I demonstrated that powerful electrical discharges of several hundred thousand volts, which at that time were considered absolutely deadly, could be passed through the body without inconvenience or hurtful consequences. These oscillations produced other specific physiological effects, which, upon my announcement, were eagerly taken up by skilled physicians and further investigated. This new field has proved itself fruitful beyond expectation, and in the few years which have passed since, it has been developed to such an extent that it now forms a legitimate and important department of medical science. Many results, thought impossible at that time, are now readily obtainable with these oscillations, and many experiments undreamed of then can now be readily performed by their means. 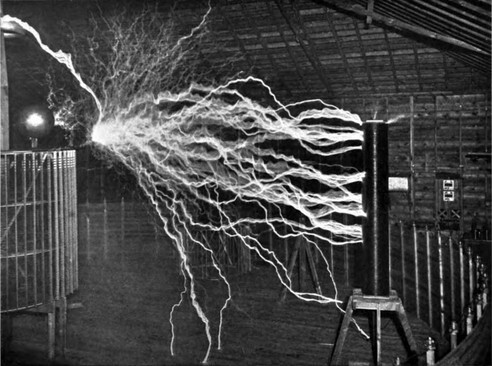 I still remember with pleasure how, nine years ago, I passed the discharge of a powerful induction-coil through my body to demonstrate before a scientific society the comparative harmlessness of very rapidly vibrating electric currents, and I can still recall the astonishment of my audience. I would now undertake, with much less apprehension that I had in that experiment, to transmit through my body with such currents the entire electrical energy of the dynamos now working at Niagara–forty or fifty thousand horse-power. I have produced electrical oscillations which were of such intensity that when circulating through my arms and chest they have melted wires which joined my hands, and still I felt no inconvenience. I have energized with such oscillations a loop of heavy copper wire so powerfully that masses of metal, and even objects of an electrical resistance specifically greater than that of human tissue brought close to or placed within the loop, were heated to a high temperature and melted, often with the violence of an explosion, and yet into this very space in which this terribly-destructive turmoil was going on I have repeatedly thrust my head without feeling anything or experiencing injurious after-effects. “WIRELESS” TELEGRAPHY–THE SECRET OF TUNING–ERRORS IN THE HERTZIAN INVESTIGATIONS–A RECEIVER OF WONDERFUL SENSITIVENESS. As the first valuable result of my experiments in this latter line a system of telegraphy without wires resulted, which I described in two scientific lectures in February and March, 1893. It is mechanically illustrated in diagram c, the upper part of which shows the electrical arrangement as I described it then, while the lower part illustrates its mechanical analogue. The system is extremely simple in principle. Imagine two tuning-forks F, F1, one at the sending- and the other at the receiving-station respectively, each having attached to its lower prong a minute piston p, fitting in a cylinder. Both the cylinders communicate with a large reservoir R, with elastic walls, which is supposed to be closed and filled with a light and incompressible fluid. By striking repeatedly one of the prongs of the tuning-fork F, the small piston p below would be vibrated, and its vibrations, transmitted through the fluid, would reach the distant fork F1, which is “tuned” to the fork F, or, stated otherwise, of exactly the same note as the latter. The fork F1 would now be set vibrating, and its vibration would be intensified by the continued action of the distant fork F until its upper prong, swinging far out, would make an electrical connection with a stationary contact c”, starting in this manner some electrical or other appliances which may be used for recording the signals. In this simple way messages could be exchanged between the two stations, a similar contact c’ being provided for this purpose, close to the upper prong of the fork F, so that the apparatus at each station could be employed in turn as receiver and transmitter. The electrical system illustrated in the upper figure of diagram c is exactly the same in principle, the two wires or circuits ESP and E1S1P1, which extend vertically to a height, representing the two tuning-forks with the pistons attached to them. These circuits are connected with the ground by plates E, E1, and to two elevated metal sheets P, P1, which store electricity and thus magnify considerably the effect. The closed reservoir R, with elastic walls, is in this case replaced by the earth, and the fluid by electricity. Both of these circuits are “tuned” and operate just like the two tuning-forks. Instead of striking the fork F at the sending-station, electrical oscillations are produced in the vertical sending- or transmitting-wire ESP, as by the action of a source S, included in this wire, which spread through the ground and reach the distant vertical receiving-wire E1S1P1, exciting corresponding electrical oscillations in the same. In the latter wire or circuit is included a sensitive device or receiver S1, which is thus set in action and made to operate a relay or other appliance. Each station is, of course, provided both with a source of electrical oscillations S and a sensitive receiver S1, and a simple provision is made for using each of the two wires alternately to send and to receive the messages. Since I described these simple principles of telegraphy without wires I have had frequent occasion to note that the identical features and elements have been used, in the evident belief that the signals are being transmitted to considerable distance by “Hertzian” radiations. This is only one of many misapprehensions to which the investigations of the lamented physicist have given rise. About thirty-three years ago Maxwell, following up a suggestive experiment made by Faraday in 1845, evolved an ideally simple theory which intimately connected light, radiant heat, and electrical phenomena, interpreting them as being all due to vibrations of a hypothetical fluid of inconceivable tenuity, called the ether. No experimental verification was arrived at until Hertz, at the suggestion of Helmholtz, undertook a series of experiments to this effect. Hertz proceeded with extraordinary ingenuity and insight, but devoted little energy to the perfection of his old-fashioned apparatus. The consequence was that he failed to observe the important function which the air played in his experiments, and which I subsequently discovered. Repeating his experiments and reaching different results, I ventured to point out this oversight. The strength of the proofs brought forward by Hertz in support of Maxwell’s theory resided in the correct estimate of the rates of vibration of the circuits he used. But I ascertained that he could not have obtained the rates he thought he was getting. The vibrations with identical apparatus he employed are, as a rule, much slower, this being due to the presence of air, which produces a dampening effect upon a rapidly vibrating electric circuit of high pressure, as a fluid does upon a vibrating tuning-fork. I have, however, discovered since that time other causes of error, and I have long ago ceased to look upon his results as being an experimental verification of the poetical conceptions of Maxwell. The work of the great German physicist has acted as an immense stimulus to contemporary electrical research, but it has likewise, in a measure, by its fascination, paralyzed the scientific mind, and thus hampered independent inquiry. Every new phenomenon which was discovered was made to fit the theory, and so very often the truth has been unconsciously distorted. When I advanced this system of telegraphy, my mind was dominated by the idea of effecting communication to any distance through the earth or environing medium, the practical consummation of which I considered of transcendent importance, chiefly on account of the moral effect which it could not fail to produce universally. As the first effort to this end I proposed at that time, to employ relay-stations with tuned circuits, in the hope of making thus practicable signaling over vast distances, even with apparatus of very moderate power then at my command. I was confident, however, that with properly designed machinery signals could be transmitted to any point of the globe, no matter what the distance, without the necessity of using such intermediate stations. 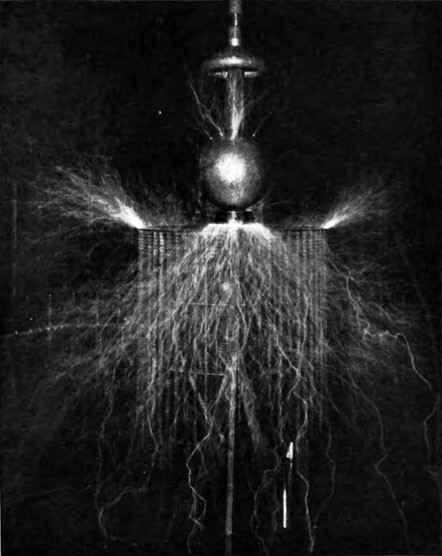 I gained this conviction through the discovery of a singular electrical phenomenon, which I described early in 1892, in lectures I delivered before some scientific societies abroad, and which I have called a “rotating brush.” This is a bundle of light which is formed, under certain conditions, in a vacuum-bulb, and which is of a sensitiveness to magnetic and electric influences bordering, so to speak, on the supernatural. This light-bundle is rapidly rotated by the earth’s magnetism as many as twenty thousand times pre second, the rotation in these parts being opposite to what it would be in the southern hemisphere, while in the region of the magnetic equator it should not rotate at all. In its most sensitive state, which is difficult to obtain, it is responsive to electric or magnetic influences to an incredible de gree. The mere stiffening of the muscles of the arm and consequent slight electrical change in the body of an observer standing at some distance from it, will perceptibly affect it. When in this highly sensitive state it is capable of indicating the slightest magnetic and electric changes taking place in the earth. 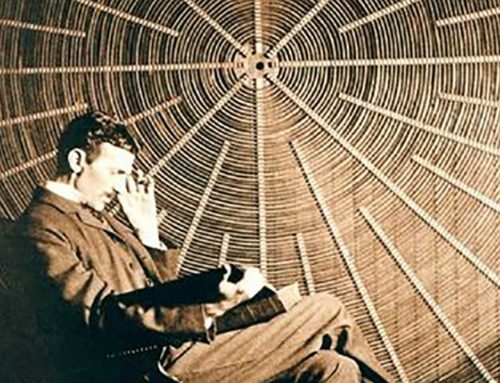 The observation of this wonderful phenomenon impressed me strongly that communication at any distance could be easily effected by its means, provided that apparatus could be perfected capable of producing an electric or magnetic change of state, however small, in the terrestrial globe or environing medium. DEVELOPMENT OF A NEW PRINCIPLE–THE ELECTRICAL OSCILLATOR–PRODUCTION OF IMMENSE ELECTRICAL MOVEMENTS–THE EARTH RESPONDS TO MAN–INTERPLANETARY COMMUNICATION NOW PROBABLE. I had arrived at the limit of rates obtainable in other ways when the happy idea presented itself to me to resort to the condenser. I arranged such an instrument so as to be charged and discharged alternately in rapid succession through a coil with a few turns of stout wire, forming the primary of a transformer or induction-coil. Each time the condenser was discharged the current would quiver in the primary wire and induce corresponding oscillations in the secondary. 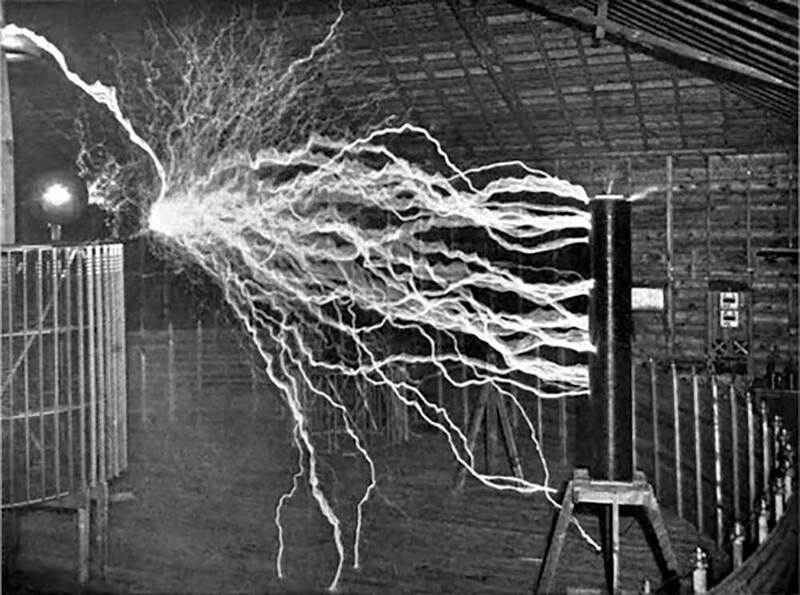 Thus a transformer or induction-coil on new principles was evolved, which I have called “the electrical oscillator,” partaking of those unique qualities which characterize the condenser, and enabling results to be attained impossible by other means. Electrical effects of any desired character and of intensities undreamed of before are now easily producible by perfected apparatus of this kind, to which frequent reference has been made, and the essential parts of which are shown in Fig. 6. For certain purposes a strong inductive effect is required; for others the greatest possible suddenness; for others again, an exceptionally high rate of vibration or extreme pressure; while for certain other objects immense electrical movements are necessary. The photographs in Figs. 7, 8, 9, and 10, of experiments performed with such an oscillator, may serve to illustrate some of these features and convey an idea of the magnitude of the effects actually produced. The completeness of the titles of the figures referred to makes a further description of them unnecessary. Note to Fig. 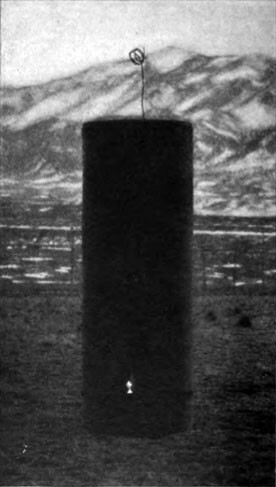 8.–The coil, partly shown in the photograph, creates an alternative movement of electricity from the earth into a large reservoir and back at a rate of one hundred thousand alternations per second. The adjustments are such that the reservoir is fulled full and bursts at each alternation just at the moment when the electrical pressure reaches the maximum. 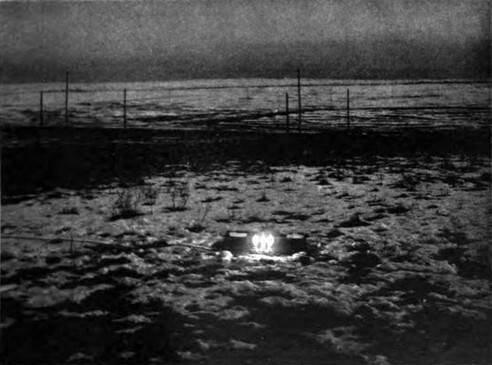 The discharge escapes with a deafening noise, striking an unconnected coil twenty-two feet away, and creating such a commotion of electricity in the earth that sparks an inch long can be drawn from a water main at a distance of three hundred feet from the laboratory. That communication without wires to any point of the globe is practicable with such apparatus would need no demonstration, but through a discovery which I made I obtained absolute certitude. Popularly explained, it is exactly this: When we raise the voice and hear an echo in reply, we know that the sound of the voice must have reached a distant wall, or boundary, and must have been reflected from the same. Exactly as the sound, so an electrical wave is reflected, and the same evidence which is afforded by an echo is offered by an electrical phenomenon known as a “stationary” wave–that is, a wave with fixed nodal and ventral regions. Instead of sending sound-vibrations toward a distant wall, I have sent electrical vibrations toward the remote boundaries of the earth, and instead of the wall the earth has replied. In place of an echo I have obtained a stationary electrical wave, a wave reflected from afar. With these developments we have every reason to anticipate that in a time not very distant most telegraphic messages across the oceans will be transmitted without cables. For short distances we need a “wireless” telephone, which requires no expert operators. The greater the spaces to be bridged, the more rational becomes communication without wires. The cable is not only an easily damaged and costly instrument, but it limits us in the speed of transmission by reason of a certain electrical property inseparable from its construction. A properly designed plant for effecting communication without wires ought to have many times the working capacity of a cable, while it will involve incomparably less expense. Not a long time will pass, I believe, before communication by cable will become obsolete, for not only will signaling by this new method be quicker and cheaper, but also much safer. By using some new means for isolating the messages which I have contrived, an almost perfect privacy can be secured. 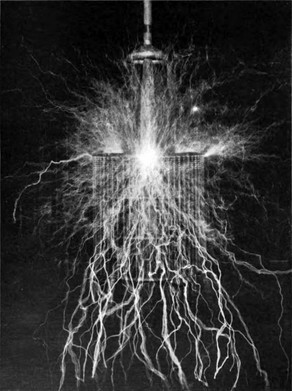 I have observed the above effects so far only up to a limited distance of about six hundred miles, but inasmuch as there is virtually no limit to the power of the vibrations producible with such an oscillator, I feel quite confident of the success of such a plant for effecting transoceanic communication. Nor is this all. My measurements and calculations have shown that it is perfectly practicable to produce on our globe, by the use of these principles, an electrical movement of such magnitude that, without the slightest doubt, its effect will be perceptible on some of our nearer planets, as Venus and Mars. Thus from mere possibility interplanetary communication has entered the stage of probability. In fact, that we can produce a distinct effect on one of these planets in this novel manner, namely, by disturbing the electrical condition of the earth, is beyond any doubt. This way of effecting such communication is, however, essentially different from all others which have so far been proposed by scientific men. In all the previous instances only a minute fraction of the total energy reaching the planet–as much as it would be possible to concentrate in a reflector–could be utilized by the supposed observer in his instrument. But by the means I have developed he would be enabled to concentrate the larger portion of the entire energy transmitted to the planet in his instrument, and the chances of affecting the latter are thereby increased many millionfold. TRANSMISSION OF ELECTRICAL ENERGY TO ANY DISTANCE WITHOUT WIRES–NOW PRACTICABLE–THE BEST MEANS OF INCREASING THE FORCE ACCELERATING THE HUMAN MASS. 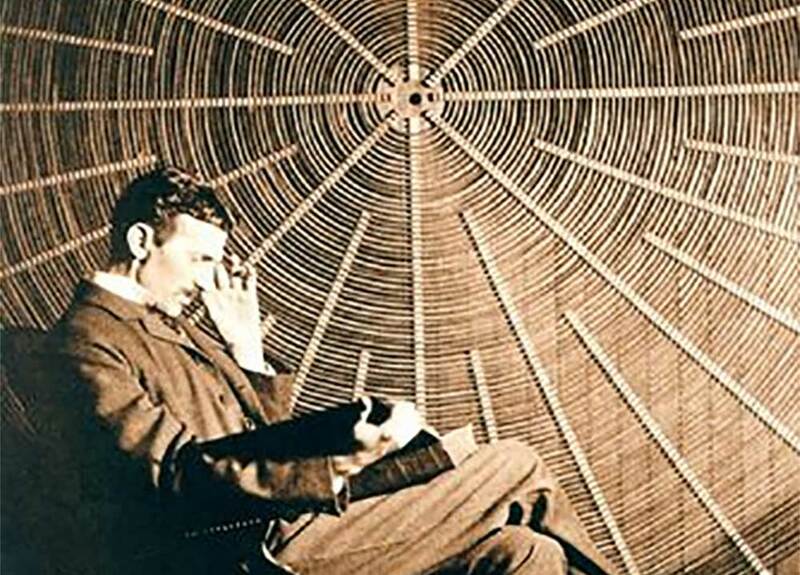 Thus the discovery of these new properties of the atmosphere not only opened up the possibility of transmitting, without wires, energy in large amounts, but, what was still more significant, it afforded the certitude that energy could be transmitted in this manner economically. In this new system it matters little–in fact, almost nothing–whether the transmission is effected at a distance of a few miles or of a few thousand miles. It is probable that we shall soon have a self-acting heat-engine capable of deriving moderate amounts of energy from the ambient medium. There is also a possibility–though a small one–that we may obtain electrical energy direct from the sun. This might be the case if the Maxwellian theory is true, according to which electrical vibrations of all rates should emanate from the sun. I am still investigating this subject. Sir William Crookes has shown in his beautiful invention known as the “radiometer” that rays may produce by impact a mechanical effect, and this may lead to some important revelation as to the utilization of the sun’s rays in novel ways. Other sources of energy may be opened up, and new methods of deriving energy from the sun discovered, but none of these or similar achievements would equal in importance the transmission of power to any distance through the medium. I can conceive of no technical advance which would tend to unite the various elements of humanity more effectively than this one, or of one which would more add to and more economize human energy. It would be the best means of increasing the force accelerating the human mass. The mere moral influence of such a radical departure would be incalculable. On the other hand if at any point of the globe energy can be obtained in limited quantities from the ambient medium by means of a self-acting heat-engine or otherwise, the conditions will remain the same as before. Human performance will be increased, but men will remain strangers as they were. Goethe’s “Hope” – Translated by William Gibson, Com. U. S. N.